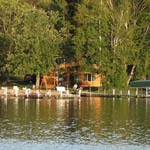 At Wildwood Resort we pride ourselves on offering our guests a family-friendly Minnesota vacation! 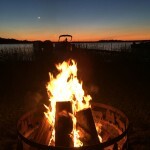 Life moves quickly so we believe in taking time to unplug and relax with family and friends. We have many resort activities for all ages! Free use of lifejackets, kayaks, hydrobikes, canoe, SUPs and hydro-paddlers. Spring is a one of a kind season in Minnesota, with the lakes thawing and the buds peeking out. Summer time at Wildwood Resorts is full of fun in the sun activities. Check out what you can do in the summer! See some of the most breath taking colors that the leaves change to. Winter offers some of the most fun of all the seasons, with ice fishing, snowmobiling, and tons more! During the summer our sand beach is always a hit with the kids. It is great for building sand castles or sunning on a warm day. Our shoreline is shallow with a gradual slope so you don’t have to worry while letting the kids wade or swim. 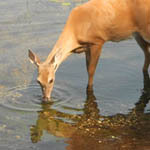 Bass Lake is a clean, clear lake with a DNR-rated clarity of 12 feet. Swimming, tubing, water-skiing or just touring the lake on one of our pontoons is highly encouraged. 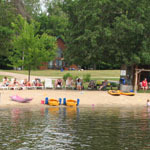 We have hydrobikes, kayaks, paddleboat, canoe and lifejackets that are available for use by our guests free of charge. 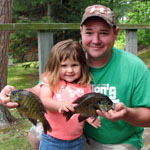 Fishing from our docks is always an adventure for the young anglers. There are plenty of little perch and sunfish swimming around our docks. If the fish aren’t biting they can always hit up mom and dad for a few quarters to play video games, air hockey, or pool in our game room. 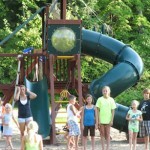 Our playground is another huge hit with our families. Built in 2003, it features safe and sturdy equipment, a hard surface basketball court and a grassy area perfect for a game of catch. Centrally located – it is convenient for mom and dad and fun for the kids! 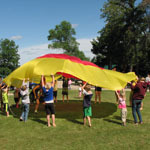 For the last several years we have offered twice-weekly kids’ activities during the summer weeks. Our supervised activities are weather and age-appropriate and often include crafts and games aimed at the grade-school age visitor. 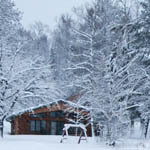 Our Lodge is attached to our home and is the hub of most of the resort activity. We sell ice cream treats, candy, ice, t-shirts and some souvenirs. We also have lake maps, free fishing advice, area information and we are always ready to enjoy some good conversation around the ice cream freezer.